These say pictures can convey volumes of information that a multitude of words could never accomplish. I'll start off here with some pictures that really could illustrate land maintenance practices that are found on any location on Earth in any country. The two pictures below are only illustrative of what the subject of this post is all about and the company from where the photos were taken no doubt does a professional job of manicuring the land for which they are hired. It is hoped however that people will gain a better understanding of what goes on under the ground before they hire such a company or take upon themselves any personal land clearing project. The photos below are merely typical of what is experienced in the clearing of land. 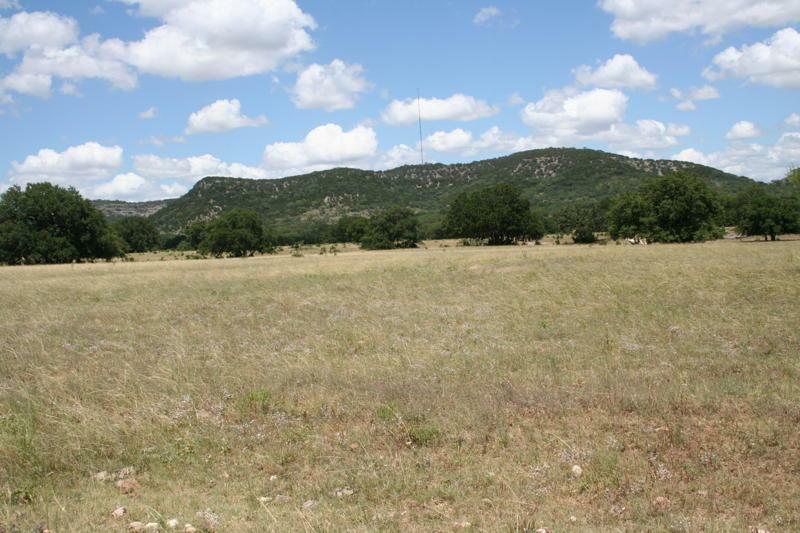 Now the company that cleared this land is out of Texas and no doubt obtains many such work contracts. 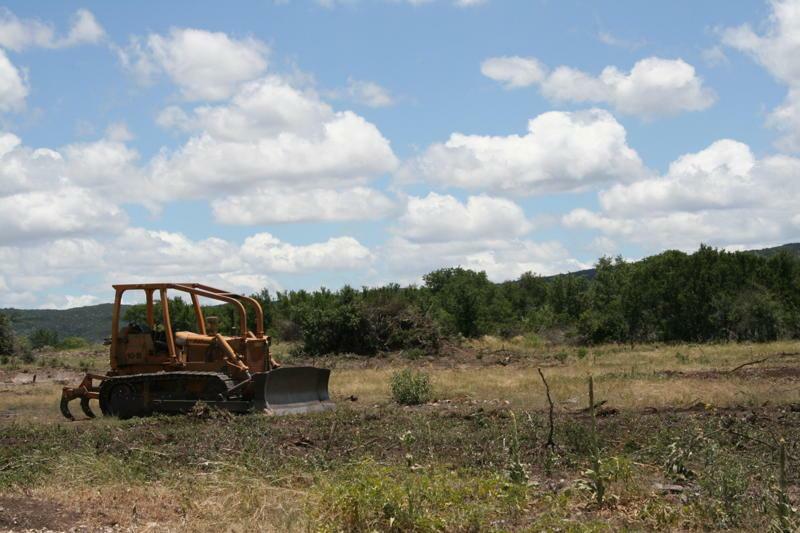 In fact on their website they show a number of pictures of the bulldozer clearing the land by scraping with a blade and pilling up a combination of mangled brush and soil in piles or a long rows of debris pushed up against the property line. This is often typical and I saw this numerous times when I lived up in Anza California. On that website, the bottom photo proudly displays the text: "Cleared Field After 20 Years". Yep, I believe it and have no reason to doubt those words. They did an effective job so that the land would never see a great amount of vegetation ever again. The land prior to the clearing project most likely had a healthy 'Mycorrhizal Internet Grid'. Yet now it most likely has more of a bacterial system to replace it. A bacterial system, as Bert Wilson of Las Pilitas California Native Plant Nursery says, favours what are called plants that are known as 'ruderals' (we know them as seasonal or annual plants, like weeds for instance) and usually a healthy ecosystem with a 'Mycorrhizal Internet Grid' under the ground tends to keep those weeds in check or at least balanced out. Take a walk or hike anywhere there is pristine chaparral plant community conditions and you will not find weeds as the over powering dominant force you find in open ranges created by humans for livestock raising. Though you will find such annuals here and there, the mycorrhizal grid is a protection and a sort of natural antibiotics for the health of any forest or chaparral community's soil. Looking at the bottom picture above, you'll notice that though it still looks like grassland after 20 years, the question comes up, 'Is it really the right type of grassland ?' What I see in that photo is mostly annual plants like wild mustard, maybe even some various types of foxtail grasses. Nothing wrong with annuals (or believe it or not weeds), they do what they do best and that is cover the land quickly. That's important because when rains come, they're function or purpose really is to slow water down as opposed to letting it run off and erode the soil. If a bad brush clearing job has been done and the top layer of biologically rich soils have been remove, then it may take years for vegetation of any kind to come back and in the mean time valuable top soil has been washed down stream. Again, anybody in any back country situation has seen what I'm talking about, though you thought nothing of it at the time. The real objective goal in any land management project should be to eventually replace the annuals with perennial system. That would be plants that live for a season being replaced by plants that may live a decade or more. For example, that Pastureland Project (if that was the intended goal of clearing the brush in the first place) above should be mostly perennial bunch grasses and other beneficial plants that one would find on a pristine prairie setting. Something like the picture below where deeper rooted bunch grasses and other plants will allow a greener ecosystem to last longer or in some cases till a summer monsoonal system kicks in. And you all know what Bunch-grasses are right ? These are individual grasses that under the right conditions send their roots down several feet into the earth (in the correct soil setting) which allows them to tap into sub-soil moisture which means they stay greener longer than those annuals that rapidly produce more seed, quickly dry out and then die only to be repeated year after year. A perennial grassland system is more desirable and is going to be more productive if you've got a livestock ranching program. The system will be more nutritious and better at self repairing after the animals pass through, that is if the rancher manages things properly. Many residents up in the Anza area when I lived there were even clever enough to transplant many of the native bunch grasses on their land into small areas of a lawn. Very clever considering Anza is a very dry air region whether it's hot or bitter cold. Those bunchgrass lawns can stay green with very little watering once established and will eventually come together and fill in the bare spaces in between them. Seriously, who wants such a jagged stickery looking nasty bush like that in their landscape ? You should. As mentioned, they often grow where nothing else will. Much of the soils they grow on is very shallow and rocky and not very deep. Remove them and try planting something you thought was cute choice or pick from the local nursery and would be a better fit in your game plan scheme of things you envisioned than that ugly old Greasewood and then watch it fail. One thing that most people who come up from the city and who buy that dream home piece of land never do is take their time that first year and get to know their wild landscapes and the ecology and geology makeup of their own property. Know something about the wild plants on that property and what they find as optimal growing conditions. Let's go back to the Greasewood as an example. 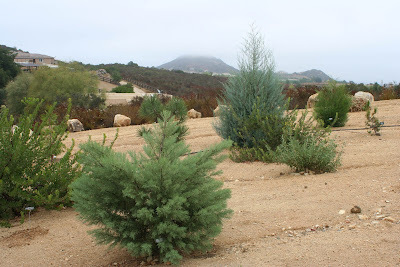 Under perfect growing conditions, even a Greasewood Shrub can be found growing as a small tree, though it has to compete for this with other plants that like the perfect growing conditions. 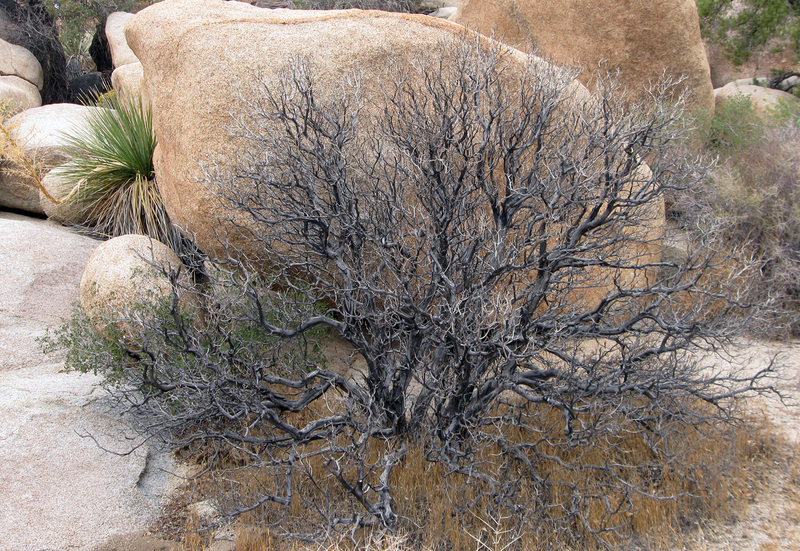 But when you see Greasewood grow in large masses or groupings on a rise or hill knoll with no other plants around and only about a couple of feet in height, then that can often tell you that below the surface there is a nasty rocky, probably bedrock situation close to the surface type of geological soil condition. Nothing else will grow there. You can check by trying to force a shovel or even a pry bar to see what's down there. Not only will your much desired plant from the nursery fail under such soil profile, but you will even rarely find the usual nasty weeds growing there. So leave the Greasewood alone. It's performing a couple of important functions for your property. First, when rains come, it slows the water down from completely running off, which is what you want it to do. Second, under that nasty ground there is still a 'Mycorrhizal Internet Grid' which I guarantee you is intact underneath those plants otherwise the Greasewood itself wouldn't be able to survive. And that grid is also connected to another grid that is networked further away in more desirable locations connecting all plant communities in the Network of cooperation for survival. And Third and possibly the most important factor is it's ability to sprout back after a fire and continue to hold the bare ground somewhat intact when the next seasons rains finally come. 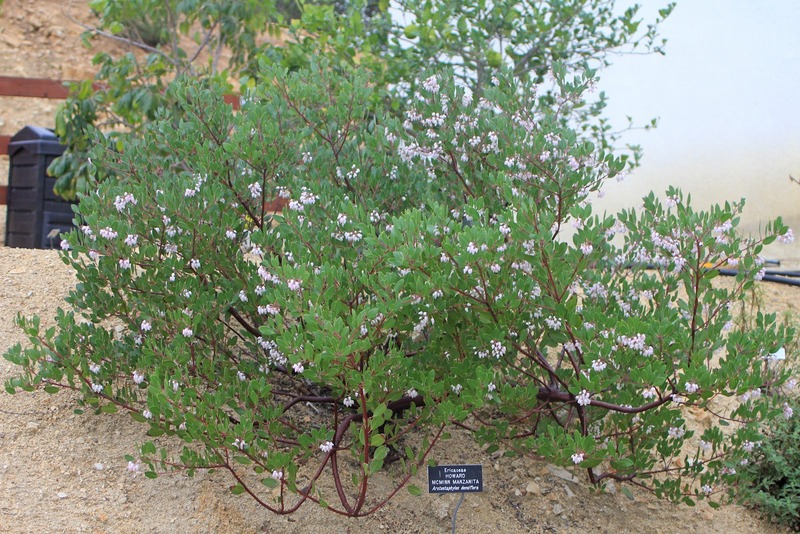 Yes, google images of the plant called Greasewood or Chamise and you will find a third of the images appear like the above. It's called Greasewood for a reason. It has a lot of volatile oils within it's wood and it is prone to wildfire situations. Anybody who moves to Chaparral country ecology situation should expect and prepare for wildfires. It's true that it's a natural part of the environment, but what is unnatural is the ever present growing frequency for which fires today come and go. The more people the greater the chances. No matter what you plant, even if you think removing the brush and replacing it with what you think is less fireprone or resistant, the reality is nothing is resistant to these later day firestorms which are more intense now than in times past. Everything will burn, but the natives will sprout back and hold your land intact better than the transplanted urban landscape reconstruction you assumed was a better idea. Now let me change channels here and show you some example photos of what some folks with good intentions and motivations for clearing land of the jagged stuff to make it more aesthetically appealing to the human eye. 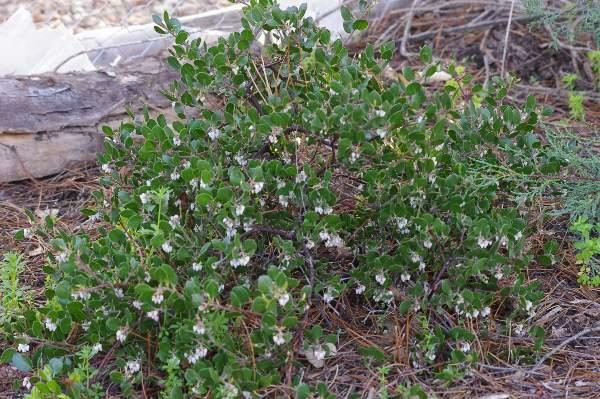 First off up in Anza where I lived, people often removed what they considered that nasty looking Greasewood to reveal more the more 'Eye Candy' pleasing shrubs like Manzanita. I love Manzanitas too, but they also need the the other surrounding infrastructure to fully benefit. Many times they will die sudden death after land clearing for no visible apparent reasons. Yup, no doubt about it. That's one of the best looking natural wild shrubs to be found anywhere, and who wouldn't in their right mind choose that over less desirable brush like Greasewood ? So here's what their land may often look like after the land clearer has followed their strict instructions of what the want ans expect from him. Of course the ultimate goal was to remove just the ugly and while keep the kool stuff. Okay, we all get the idea about clearing (cleaning) the land up and leaving the desirable things. I get that and actually agree with it, but there are things to consider. Yes, of course the Fire Marshals ordered you to clean the land up, but then you cared about your land enough already and were going to do that anyway without them making you do it. But now consider the methods you use. The 24 years I spent up in Anza, California, I saw folks hire someone who was in the business of brush clearing or they themselves with their own little Adult toy Kubota Weekend Farmer Tractor and using that blade to literally scrape off several valuable inches of that biologically rich topsoil down to a clean sterile looking decomposed granite type of soil so that they could plant a yard that looks like this example below. Here's some more examples of land clearing in which selected desirable trees or shrubs are left. But often later some of those saved plants may die. The photograph below this paragraph is take from the website of "The Chaparral Institute" which was taken I believe in northern San Diego County. It illustrates panic over fire danger and the mastication method of chewing up and actually stripping the landscape to reveal nothing but raw bare sterile soil which may no longer contain the natural grid which was installed and regularly maintained by nature for thousands of years. Even if the saved single or grouped specimens of Manzanitas, Oaks or Pines make it for a time, they may eventually die as a result of being disconnected from the "Earth's Internet". Such geographic landscape profiles don't necessarily have sub-soil water stores from which to draw from. Before the masticated land clearance, those plants were dependent on their being connected to the complete mycorrhizal and plant root grid that was networked completely around those slopes to facilitate water transportation from lower stores further down the slope during the dry season. Now they are up dry creek so to speak. This practice is parroted by many landowners who actually lose some of their prized shrubs when they believed they were doing a good thing in manicuring their property. 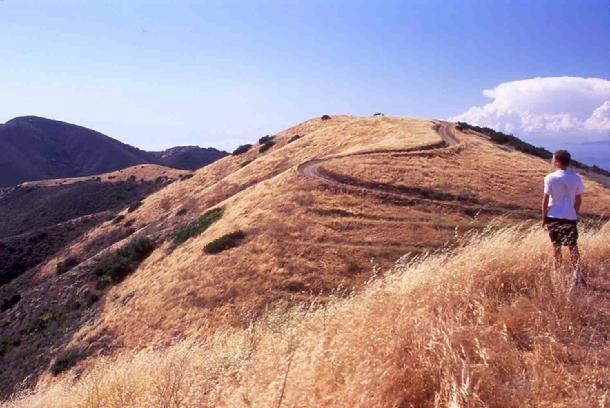 This next photograph above was taken from the "California Native Plant Society"
"The cost of viewing chaparral as fuel. This remarkable stand of manzanita chaparral in the Cleveland National Forest that was featured on the Fall 2007 cover of the California Native Plant Society’s quarterly journal Fremontia was masticated by the USFS in 2008. The mastication shown above continues around a Coulter pine tree plantation. The area is miles away from any community"
"Rather than dealing comprehensively with wildfire risk, many local governments are promoting vegetation “clearance” strategies that seriously compromise protected wildlands, challenge the integrity of habitat conservation plans, and increase the spread of invasive species. Some San Diego County officials have expressed the desire to exempt such vegetation “treatments” from the California Environmental Quality Act. Under the federal Healthy Forests Restoration Act, millions of dollars are spent to “treat acres” rather than dealing with fire risk where it would be most effective, immediately around and within human communities. Please join us as we discuss threats posed to California’s native plant communities by misguided fuel treatment projects and what you can do to help protect San Diego County’s native plants from unwise land use policies." This next photo below is again taken from "The Chaparral Institute" website which clearly shows what grows back after stripping the land of it's natural mycorrhizal grid into a bacterial system which as Bert Wilson points out favours plants that are 'ruderals' as in this case foxtails & non-native oats which in fact burn like gasoline. At least brush could have slowed a fire down somewhat, but now is facilitated by a more combustible fuel which when high wind fed on a ridge will allow fires quicker access to the other side of the ridge. At least with fires slowed down with brush, fire retardant dropping planes could make a ridgeline strip ahead of a slower moving fire than one blowing full steam ahead in a grassland setting. However, it should now be noted that with climate and weather pattern change, these higher winds are more common than any time in the past and nothing really will stop them. This can be seen from the last several years of firestorms which have devastated many communities prone to such problems. This next picture below I've taken off another blog by a gal who lives in Murrieta CA. She's into native plants and this picture is not a bad example of land clearing but is rather an illustrative example of what some land clearing can look like when some plants are selected to be kept. In this case she has replanted with native plants to establish more desirable that she appreciates into here garden environment. But notice the irrigation drip system. This is what is keeping the plantscape live until a proper root system with mycorrhizal networks can take over. Now I like a clean looking property, but the only thing really keeping these plants alive is the constant presence of the drip irrigation system and that's if the critters don't chew it up. One note of caution here though is that you should NOT allow your natives to become dependent on a drip system. The ideal thing is to gradually ween them off it once established. Believe it or not, at my mum's house, though I did install an elaborate irrigation system at her house in El Cajon CA, most all the plants have roots down deep enough to penetrate deeply to get to sub-soil moisture which is what they want anyway. So the system is not on any timer and is only needed occasionally because of a few water loving plants like 'California Spicebush' and some wild currents in the understory of the trees. If the biological material (mycorrhizae, beneficial bacteria, etc) has been removed or scraped off and pushed to the property line and even if they inoculated the ground within each planting hole, it will take much longer time to recover. Those native plants BTW that people try and save will often succumbed to sudden dying with what appears to be no rhyme or reason to the landowner. Now back to the prized Bushes that were saved, like those wonderful Manzanitas. How many times have you seen someone's property that was cleared to leave only the desirable Manzanita plants which may look like this example below in the picture on a manicured sterile kool looking landscape. I actually like a clean sterile sort of landscape in my immediate yard, but a little of the plant's own dander or mulch layer should be left. Again below here is another nice picture from Arleen Webster in Murietta CA landscape. Only a year or two after a property owner's land clearing job was done, some of them died unexpectedly and look something like the photo below ? The shrub starts out slowly by allowing some side branches to die back as a strategy measure to save itself from lack of moisture which it may have had prior to brush and soil clearing which took away the grid network underground where other plants had water access and shared these with your prized Manzanita only to later eventually die as a result of an ignorance on your part for not being acquainted with the "Earth's Internet". I know from first hand experience. I've done a lot of stupid stuff and learned the hard way. Take a look below. This is what is left after I cleared all the other shrubs around a Manzanita that was originally 10 times the size of the skeleton you see in the photo taken last year what we visited my old property again. The small tree was almost 20 feet in diameter when I first bought the place in 1985. It wasn't so much the height of the tree that was impressive, but it had numerous large side branches that grew up and out finally to heavy to stay upwards and lowered to the ground only to re-root (often common in Manzanitas) then grow back up into the air to create another extension of the original tree. Never did a trunk ring core sample, but it had to have been a couple of hundred years old maybe ? Who knows, it's gone now. It was after my own bad experiences that I realize clearing slowly by hand and then replacing the cleared undesirables with something more appealing, usually another native was the answer. Also I was never in a hurry after that. I got some other neighbours and friends in the area involved in planting pine trees and incense cedar on their properties purchased from L.A. Moran Forest Nursery near Davis California. They shipped bare root trees around March if I remember correctly and you had to get them in the ground as quickly as possible. The land cleared by hand was superiorto the mechanized cleared land. Those trees planted in hand cleared ground grew faster than the land where the grid was disrupted by machinery. This practice of the superiority of hand clearing is also born out in a report of Tamarisk Removal down in the Coachella Valley at 1000 Palms. Plant restoration was faster and more complete on one side where Tamarisk was removed by hand, than land cleared of Tamarisk by machine. If you have the time, take a read of the report here below. Here are some important quotes from that report. Now pay attention. "Most areas were cut by hand, thereby selectively cutting out the tamarisk while leaving the native shrubs unharmed. Only a 7.5 acre (3 ha) section that was heavily infested (> 95%) was cleared using a bulldozer." "In the 7.5 acres (3 ha) that wasbulldozed, natives established much more slowly than in the hand-cleared areas." In that post I explained and illustrated how all plants can be connected to an undreground interconnected grid of 'Mycorrhizal Fungi' Same species of plants or different species of plants can all be connected to this grid. I showed that no matter where I placed the irrigation dripline, that eventually the entire 24 trees were hydrated from the original source of H2O but only because they were connected to the grid. For a moment, let's illustrate things this way by considering all sorts of human infrastructure for which we all are dependent and easily recognize in the real world. Electrical Network grids, Gas Pipelines Systems, Plumbing Grids of water Companies, Internet Cable Networks, Telephone Network systems, etc. Now in order to receive the benefit of these services we understand that we don't need to have our home literally or physically connected to the source of that service provider by being right next to it. Let's take a look at an electrical grid network map example of the United States. So we all understand that on that major network of the grid systems are the original sources of electricity by Hydroelectric Dams, Coal or Gas fire Electrical Plants, Solar Farms or even Nuclear Energy Plants. We also are aware that we don't have to have our home physically next to one of those Industrial Plants to be able to plug or tap into the system to receive benefits. In fact we understand that we only have to be connected to an infrastructural grid as installed by the electric company as pictured below. For you folks in Anza, this is how your Anza Electric Copperative works. You don't need your home to physically be on Larry's Agri-Empire land next to the Coop's building to receive electricity. Just connect to the grid they've intelligently built and if it's not available and you've got the big bucks to shell out, they can string the grid to your own home out in Timbuktu (RimRock Rd). Okay kidding. The same is true of all plants. Many plants will be located at the sources of water, be they streams, rivers or lakes, or even ecosystem foundational plants that are able to tap into several meters deep moisture caches or reservoirs, then lift & redistribute from their tap roots to their nieghbours thru the 'Mycorrhizal Network'. Most likely those sensitive Manzanitas may have had that grid system disrupted. They likewise can often be found on top of knolls where the soil is shallow and rocky and seemingly dry, yet they thrived because they were tapped into the system via some of those Mountain Mahoganies or Redshank you didn't think were good looking enough for your overall future plans. This is why it's important to examine your land for a year before you make major decisions you'll wind up regretting as I did. A prime example for Anza of large trees connected to the grid when they look to be in a dry impossible location is when driving up the HWY 371 as it enters the Hamiton Creek Canyon. Look over on both sides of the canyon. Notice that this isn't exactly ideal garden soil, yet look at the many huge Jeffrey, Coulter Pine and Interior Live Oak trees on those dry rocky hillsides. There is not even hardly any natural mulch layer under those trees. The actual rich water source is way down at the bottom of that canyon in Hamilton Creek. Yet, there are plants there like the willows and maybe some cottonwood, which BTW are also host to the same Pisolithus tinctorius Mycorrhizae that colonizes those pines on the canyon hillsides. These trees may be the fascillitators for transporting through the grid sources of fresh water to other life around them. The ability of this fungus to transport water 200' up a mountain side can be seen in many examples where the grid is intact even on southern hot and dry exposures coming up from Hemet to Mountain Center on HWY 74. For more info on what some call the Dog Turd fungus go over to Tom Volk's website and have a read. Hope this was informative to all. 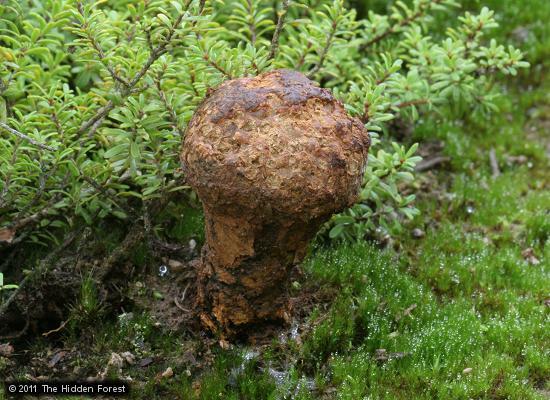 If you are aware of your natural surroundings when out hiking, you'll recognize this puffball or truffle around many of the scrub oaks or pines trees where you live. Especially not long after lightening storms which I'll talk about another time. The above truffle which is nothing more than the actual fungi's fruit is also the same one creating this internet grid in this famous picture referenced around the Net. Aren't Illustrations Informative ? 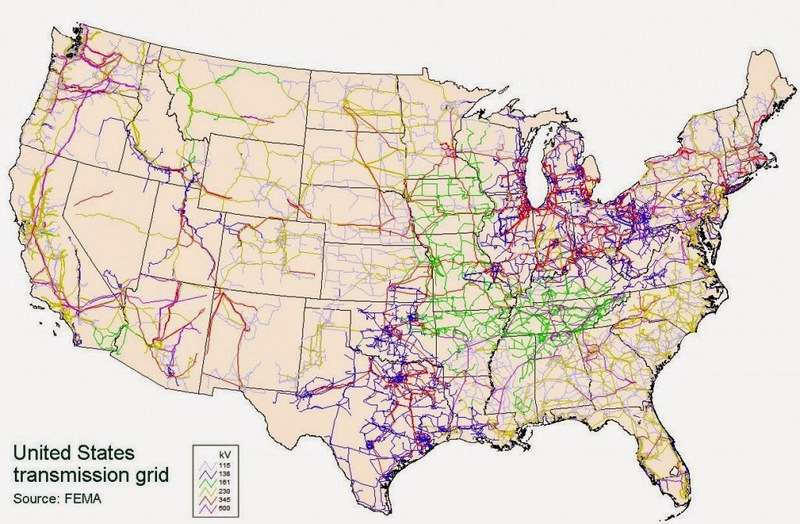 Think about the map of the electrical grid of the United states you just saw. Try real hard an picture in your mind's eye what the ground looks like under your property the next time you want to plan something for the landscape. Seriously, if you want to talk about what you do and add something to the conversation and education, then by all means contribute. But you don't have to make a quick token comment and sneak in some spam at the end. Mention your company in a comment and what you do as far as possitve responsible tree trimming or landclearing. The guy from Indonesia did the same exact thing and there is no reason for it. I have no problem with possitive feedback but I'm not interested in east European spammers. "I didn't think how big of an effect improper land clearing can have on the "internet" of the Earth (as you put it). You should really check with local bylaws and with professionals to make sure you're doing it right. I heard about someone who incurred a pretty hefty fine for doing improper land clearing. Your comment would have far more credibility as being some worth if you weren't some Central Asian using a bogus European name and spamming the internet with cheezy websites. You've been put on notice and reported to Google.